Last weekend I was in New York – The big apple, The Concrete Jungle. Whilst our trip was to celebrate my best friend’s 30th Birthday, we were also there to shop, eat and have some fun. Obviously what happens in New York stays in New York, but the food, I can comment on. 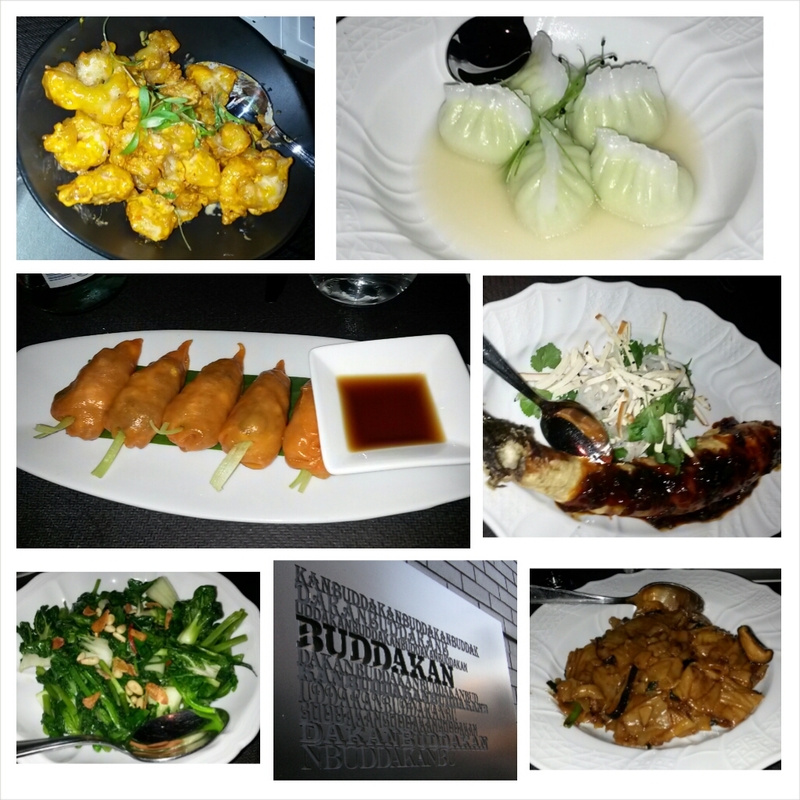 In a nutshell, this was our New York Gourmet adventure..
On Friday we dinnered at Buddakan. A friend’s friend sent us there under the pretence that “you’ll always get lots of veg food at chinese restaurants”. My New York geography is pretty crap so I’m not gonna give directions or locations, however the restaurant was pretty much what you’d expect when you think of New York. Big, high ceilings, double floor, mood lighting, not that dissimilar to the old Buddha bar in London. We were a little late and it took them a little while to seat us, but once we were seated the waiters were very attentive. We ordered a number of dishes including Edamame dumpling, Carrot Dumpling, Wild Mushroom Chow Fun, Asian Stir Fry Greens, Crispy Szechuan Eggplant with smoked tofu and pickled daikon and the birthday girl ordered a Chilli Rock Shrimp. Certain elements of the meal were delicious – namely the garlicky silkyness of the Edamame dim sum and the crunchy texture of the Carrot dumpling. Just sitting here writing, I’m craving the Edamame dim sum. Miss Mel also raved about the rock shrimp, however by the time I got round to tasting it after 12, it was slightly soggy, i’ll take her word for it though! Certain elements of the meal were good – the Wild Mushroom Chow Fun (known as Ho Fun in the UK) was the right mount of gloop with some quite yummy mushrooms thrown in. Ho Fun is a bit of a comfort food and this really did hit the spot. The Asian Greens were stir fried with pine nuts and garlic chips, I would have never thought to have put pine nuts in a chinese stir fry, but it worked really well. Certain elements of the meal weren’t so great – Miss Mat loved the idea of the Crispy Szechuan Eggplant with smoked tofu and pickled daikon, so we went ahead and ordered it. What we received was a giant aubergine, stuffed with some kind of sweetish filling with a salad of smoked tofu (slightly rubbery) and pickled daikon on the side. Not really sure what was meant to be crispy about the dish but we got through about a quarter of it before giving up.Definitely one to miss. On the whole, some parts of the food were better than others – but this is generally the case with most restaurants. I think were slightly spoilt in London – we get authentic takes on so many world cuisines that when we get something slightly different, its easy to criticise. I would visit again to try some of the meat/fish options, however not in too much of a hurry.